Theoretical calculations and experimental studies of the influence of wear on the cutting process and the precision parameters of machining by hard alloys during milling are described in the article. The method of aerodynamic hardening is designed to increase the durability of tools, which are heterogeneous compositions of tungsten carbides, titanium and tantalum with cobalt ligature operating under severe process conditions with varying impact loads. The effect of hardening by the ADH method is achieved due to the influence of sound waves on the structure of hard alloys. The results of imitation studies of the wear process in the DEFORM system are described. G. I. Granovskij and V. G. Granovskij, Rezanie metallov [Metals Cutting]. Moscow, Russia: Vysshaja shkola Publ., 1985. (In Russian). Vadym Stupnytskyy and Andrij Kuk, "Determination of deformation component roughness parameters using the methods of rheological simulation modeling of the cutting process", Austrian Journal of Technical and Natural Sciences, no. 3, section 4, pp. 33–37, 2014. V. Stupnytskyy, "Issledovanie adiabaticheskogo sdviga struzhki pri mehanicheskoj obrabotke titanovyh i nikelevyh splavov na osnove analiza rezul'tatov imitacionnogo reologicheskogo modelirovanija v sisteme DEFORM" [“Study of adiabatic chip shift during machining of titanium and nickel alloys on the basis of analysis of the results of imitative rheological modeling in the DEFORM system”], Nauchnyj (proizvodstvenno-prakticheskij) zhurnal “Vesnik Grodzenskaga Dzjarzhawnaga Wniversitjeta Imja Janki Kupaly”, no. 3 (158), issue 6, pp. 76–86, 2013. (In Russian). G. S. Zheleznov, "Ocenka sil, dejstvujushhih na faske iznosa instrumenta po zadnej poverhnosti" [“Evaluation of forces acting on the tool wear face on the back surface”], Stanki i instrument [Machines and tools], no. 6, pp. 1–3, 2003. (In Russian). 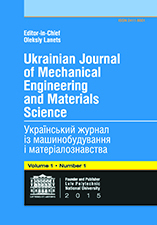 Vadym Stupnytskyy, “Investigation of the influence of machining factors on the workpiece deformation mode in the chip-forming zone by the finite element method”, Ukrainian Journal of Mechanical Engineering and Materials Science, vol. 2, no. 2, pp. 61–70, 2016. V. L. Strel'cov, “Issledovanie processa kontaktirovanija zadnej poverhnosti rezhushhego instrumenta s obrabatyvaemoj poverhnost'ju” [“Investigation of the process of contacting of the back surface of the cutting tool with the surface being machined”], Vestnik mashinostroenija [Bulletin of Mechanical Engineering], no. 10, pp. 38–41, 2001. (In Russian). I. Ja. Shtaerman, Kontaktnaja zadacha teorii uprugosti [The contact problem of the theory of elasticity]. Moscow, Russia: Gosudarstvennoe izdatel'stvo Tehniko-teoreticheskoj literatury Publ., 1949. (In Russian). L. A. Galii, Kontaktnye zadachi teorii uprugosti i vjazkouprugosti [Contact problems of the theory of elasticity and viscoelasticity]. Moscow, Russia: Nauka Publ., 1980. (In Russian). A. N. Zhigalov, Adaptivnoe upravlenie pri sovmeshhennoj obrabotke rezaniem i PPD [Adaptive control with combined machining and PPD]. Mogilev, Belarus: MGUP Publ., 2013. (In Russian). A. N. Zhigalov, G. F. Shaturov and V. M. Golovkov, “Sposob ajerodinamicheskogo uprochnenija izdelij” [“Method of aerodynamic hardening of products”], BY Patent 21049, June 30, 2017. (In Russian). A. R. Maslov and A. N. Zhigalov, “Povyshenie soprotivlenija iznashivaniju tverdyh splavov metodom ajerodinamicheskogo vozdejstvija” [“Increasing of wear resistance of hard alloys by the method of aerodynamic action”], Trenie i iznos [Friction and wear], vol. 35, no. 5, pp. 461–466, 2014. (In Russian). P. I. Jashhericyn, E. Je. Fel'dshtejn and M. A. Kornievich, Teorija rezanija [Theory of cutting]. Minsk, Belarus: Novoe znanie Publ., 2006. (In Russian). Vadym Stupnytskyy, “Computer Aided Machine-Building Technological Process Planning by the Methods of Concurrent Engineering”, Europaische Fachhochschule: Wissenschaftliche Zeitschrift, vol. 2, no. 3, section 1, pp. 50–53, 2013. A. Zhygalov, V. Stupnytskyy, "Investigation of the Carbide-tipped Tool Wear Hardened by Method of Aerodynamic Impact", Ukrainian Journal of Mechanical Engineering and Materials Science, vol. 3, no. 2, pp. 11-23, 2017.